I thoroughly enjoyed this book (and the subsequent books: PROMISED and PRIZED). 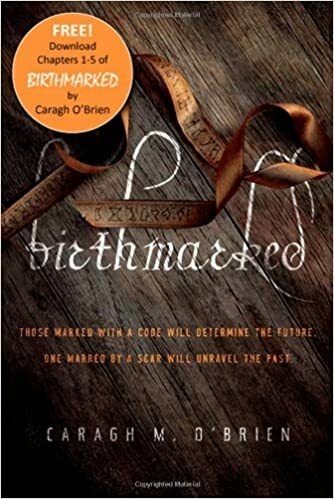 Caragh M. O'Brien has created a world near enough to ours that it's relatable, but with an underlying fantasy that still allows the reader's mind to wander into the unknown of could this be future or past or far off or around the corner? It's dystopia but, I feel, doesn't rely on that fact to work as the issues and the author's craft shine brighter than the genre alone. The story is well rounded and pulls on the emotions of the characters, their plight, complicated relationships, and, in turn, the reader. In this first book of the trilogy, we get to journey along with Gaia Stone. Deemed a 'freak' because of the large burn-scar on her face, she holds a respected place in her community as a young midwife just leaving the under-wing of her mother's guidance and mentoring. She lives, with her lower class people, on the 'wrong' side of a wall separating the two classes: The Enclave and the subservient people of Wharfton. Her duty in society as midwife for her section of Wharfton is to reach her quota by advancing three babies a month to the Enclave for a chance at a better life. But when her parents are mysteriously arrested and imprisoned by the Enclave, Gaia is forced to question everything she's always held dear: her loyalty to the Enclave, her role as midwife, that her scar was an accident, and the honesty of her parents. Gaia, a daring, fierce, yet vulnerably human 16-year-old heroine, will find herself up against the all powerful Enclave, making unlikely friendships and resisting forbidden romances, as she tries to rescue her parents. I highly recommend this read that explores so many important issues but within the context of YA fantasy reminiscent to that of Lois Lowry's THE GIVER Quartet. Readers curious about this series can read the first 5 chapters of BIRTHMARKED on both Amazon and Barnes and Noble for FREE!! !